Filed to: Who needs money?Filed to: Who needs money? 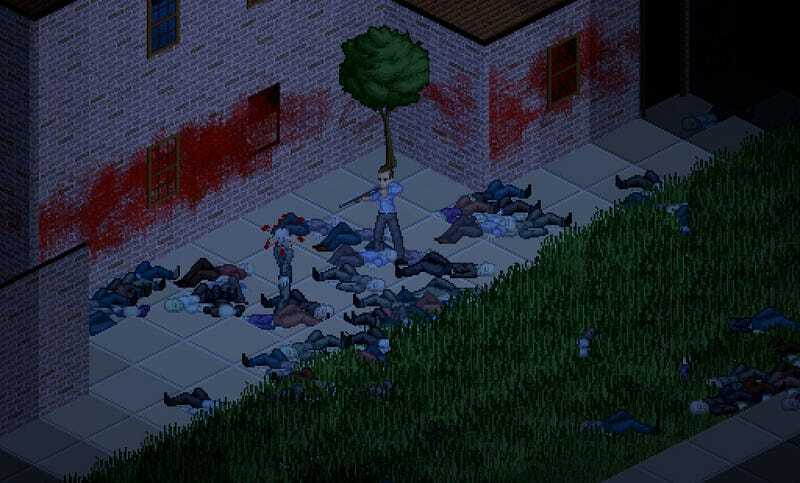 The handful of people making zombie survival horror game Project Zomboid have pulled their game from the Internet, not because they hate that their game is getting pirated. They expected that. They could even live with that, as they had been, quite merrily. "In the zombie apocalypse, I died of cooking soup." They have pulled their £5 game because, despite their tolerance for piracy, they're now definitely losing money to piracy. A new pirated version of the game includes an "update" button that, any time it's clicked, forces a new download of the whole thing from the cloud servers that the Zomboid team uses to distribute the game. Each download from that service has to be paid for, by the developers. Whether piracy actually amounts to lost sales we're not going to get into. The possibility that it raises awareness and promotes the game cannot be ignored, but the difference is offline versions on torrents, which we've been largely unconcerned about, do not cost us real money [emphasis in the original], only potential money, and even then we can't really guess at what the net effect is. Likewise people who download the game through our website only download it when there is a new version, so once every week or so. These new pirate copies have an ‘update now' button which will download the game every time it's clicked, potentially every time the game is run by everyone using it. They've pulled the game, but are offering a public demo via torrent. Do check it out and consider this an important anecdote for the ongoing arguments about who piracy serves, who it hurts and who it helps.